This week we’ve got two beautiful yarns from Red Heart; the one I’m going to go over today is called Creme de la Creme. This is a worsted weight cotton that comes in so many colors it will give you some serious indecision. This is a yarn that I get from Red Heart, personally, all the time. I also always suggest this yarn to beginners to start with since you can knit a stockinette dishcloth from it and you get something functional as well as fun. As I mentioned, there are tons and TONS of colors for this yarn. I feel 100% safe in saying that there’s truly a color for everyone. 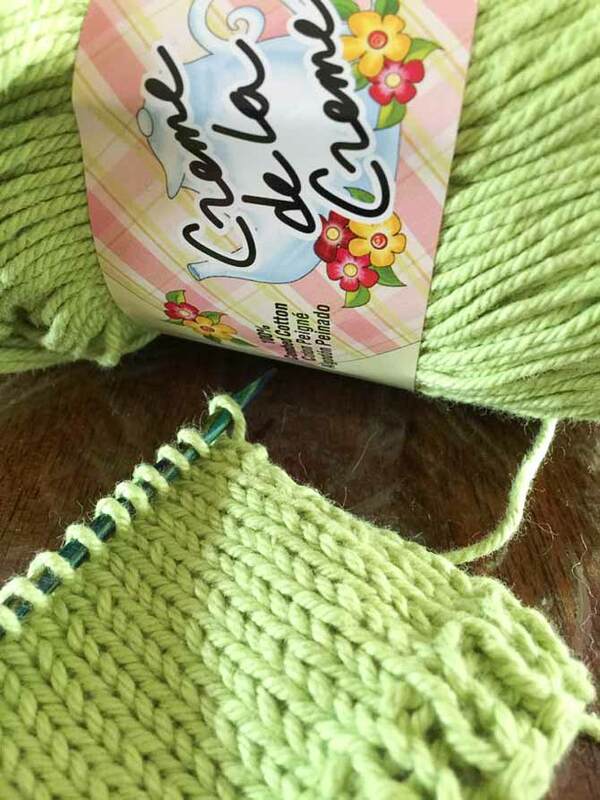 That is part of the reason why I always suggest Creme de la Creme yarn to people who come to me to learn how to knit. With all those colors to choose from, they can pick one that resonates with them and knit away. They could even pick out two or three skeins in case they want to mix and watch or they get bored easily. 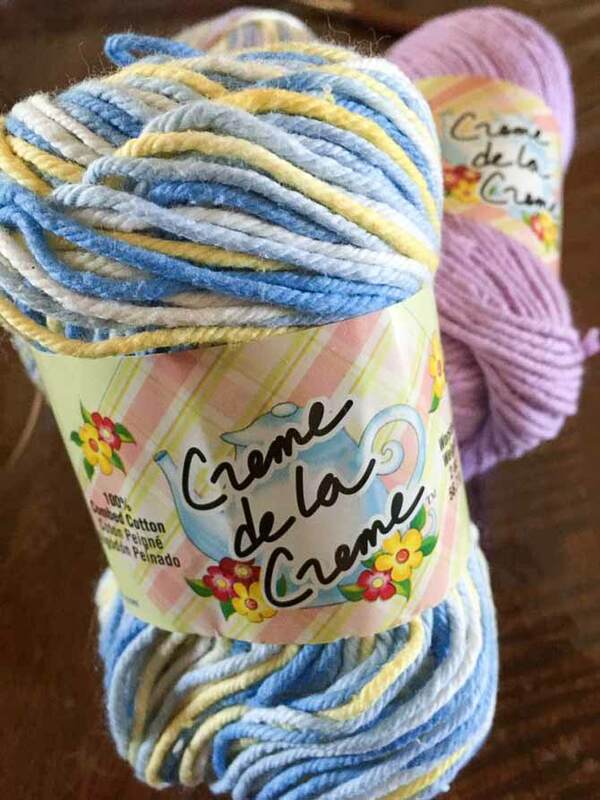 Creme de la Creme is 100% combed cotton so it’s soft, but there’s also not very much stretch at all. If you’ve ever knit with cotton before you’ll know what I mean, some knitters find that knitting with cotton is hard on the hands. If this happens to you, listen to what your hands are telling you. If they’re done knitting, then so are you. Don’t try to marathon through and cause yourself pain in the future. Creme de la Creme on the needles! That green is such a FABULOUS color! 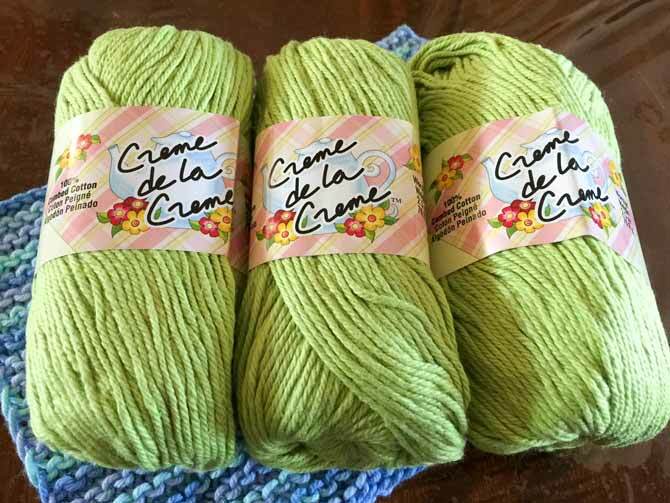 Creme de la Creme is a worsted weight which is smack dab in the middle of the whole bigger or smaller yarn spectrum. It’s big enough that beginners aren’t scared of it, yet small enough seasoned knitters won’t mind using it for their projects as well. Since cotton is a light fiber it’s great for use in any number of summer accessories, which is the season we’re neck-deep in. If you’re not tempted by the lighter, airy fiber, then you should be tempted by the durability. Creme de la Creme starts out soft, and only gets softer as you wash it. Machine washable and dry-able means you can do that as often as you like. Repeated washing isn’t going to felt your stitches either. Cotton shows excellent stitch definition and doesn’t pill much over time. These cloths are freshly knit, but it will look like this for a while! No more pills! No matter what you’re making, it’s bound to be long-lasting and durable. These are two of the many reasons why most dishcloths are made from cotton, but I’ll go much deeper into that tomorrow. 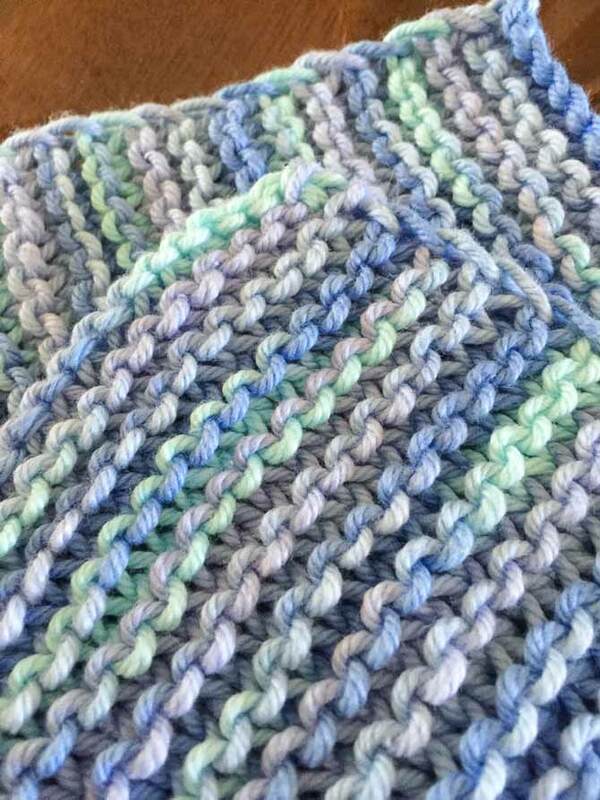 Stay tuned to find out more about dishcloths and several tips on how and why to knit them.